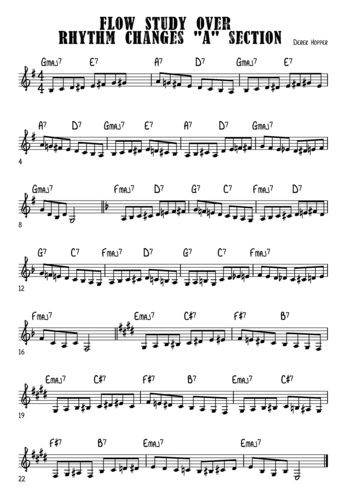 This a simple flow study written over the chord changes for the jazz standard I got rhythm A section. I usually slur it but any combination of articulations can be used. Some notes are below the normal range of the trumpet but you can put them up an octave if you don't wish to play pedals. Unless otherwise stated, the content of this page is licensed under Creative Commons Attribution-ShareAlike 3.0 License. Works with most up-to-date browsers (older versions and Internet Explorer may work inadequately). Adobe Flash Player -plugin is required for metronome and audio player.